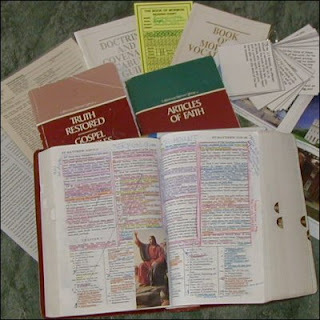 "Rediscover them again and again..."
In a Priesthood Leadership Meeting in April of 1986 Ezra Taft Benson discussed the importance of the Scriptures (CLICK HERE). In this talk he mentions how hard the leadership strives to increase sacrament meeting attendance, get more young men to serve missions, improve numbers of those attending and marrying in the temple, and how such striving has a rather simple solution. He says, "when individual members and families immerse themselves in the scriptures regularly and consistently, these other areas of activity will automatically come" (italics added). By immersing ourselves in the scriptures daily our testimonies grow, and we are more susceptible to personal revelation. As if those blessings aren't enough, President Benson goes on the mention just some of the most important promises if we study diligently. 1) Have Prosperity and Success: quoting Joshua 1:8 "This book of the law shall not depart out of thy mouth; but thou shalt meditate therein day and night, that thou mayest observe to do according to all that is written therein: for then thou shalt make thy way prosperous, and then thou shalt have good success" (italics added). 2) Be Healed: from Jacob 2:8 "they have come up hither to hear the pleasing word of God, yea the word which healeth the wounded soul" (italics added). 3) Recognize the Truth: President Benson mentions how when we are so immersed in the "doctrines of the world" it becomes easy to question the "doctrines of the gospel". The Savior promised "And whoso treasureth up my word, shall not be deceived" (JS-M 1:37). 4) Gain Direction: from Psalms 119:105 "Thy word is a lamp unto my feet, and a light unto my path." 5) Pull Free from Sinful Tendencies: Helaman 3:29 "...whosoever will may lay hold upon the word of God, which is quick and powerful, which shall divide asunder all the cunning and the snares and the wiles of the devil." May we all do as Spencer W. Kimball said and "discover the scriptures for ourselves--and not just discover them once, but rediscover them again and again..." (Ensign, Sep. 1976, pp.4-5). By dong so we will recognize the paths that lead us to our own Salvation. Today missionaries are more effective than they have ever been due to the blessing of having the improved teaching manual "Preach My Gospel". It gives each individual missionary the tools they need to be able to teach from their own testimony and experiences. Recently I decided I wanted to study the scriptures more like I did when I was a missionary. I remember what a blessing it was to jump out of bed, get ready, and then immerse myself in the scriptures every morning. In order to restore my "super powers" I went to the manual, and studied Chapter 2 (which I highly recommend to everyone by the way!). The following are the tips I gathered that will make your morning devotional the best vitamins you could ever have. 1) Exercise & shower before study. Being alert is key to effective study. 2) Study at a desk or table (not lying down) where you have access to writing tools. 3) Begin study with a prayer. According to the manual "study is an act of faith requiring the use of personal agency". We must actively hunger and desire for revelation and knowledge, and ask the Holy Ghost to give us the inspiration we need. 5) Live the revelation you receive. For revelation and inspiration to keep coming you must act upon the information you receive. I was once taught about the importance of writing down EVERYTHING you are inspired to do while studying by a teacher who basically said, "the Lord will only continue to give you revelation if He knows you will continue to receive it". Carelessly discarding information may cut us off from future personal guidance.